M. Cocceius Nerva was born at Narnia, in Umbria, A.D. 32. He was consul with Vespasian 71, and with Domitian 90. On the assassination of Domitian in Septemnber, 96, Nerva was declared Emperor at Rome by the people and the soldiers. 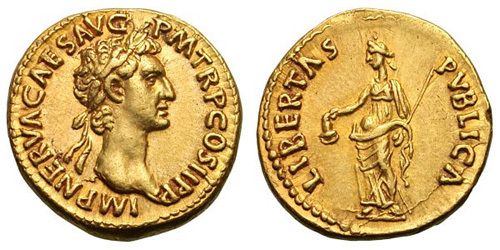 Obverse: IMP NERVA CAES AVG P M TR P COS II P P, Laureate head right. Reverse: AEQVITAS AVGVST, Aequitas standing left, holding scales and cornucopiae. Reverse: CONCORDIA EXERCITVVM, Clasped hands. 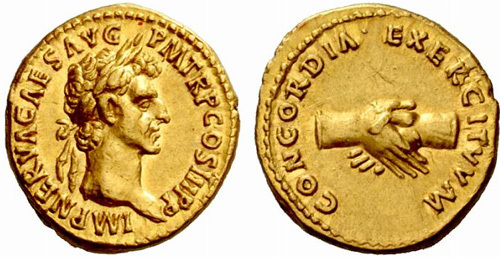 Reverse: CONCORDIA EXERCITVVM, Clasped hands holding legionary eagle set on prow left. Reverse: FORTVNA AVGVST, Fortuna standing left, holding rudder and cornucopiae. Reverse: FORTVNA P R, Fortuna seated left, holding ears of corn and sceptre. 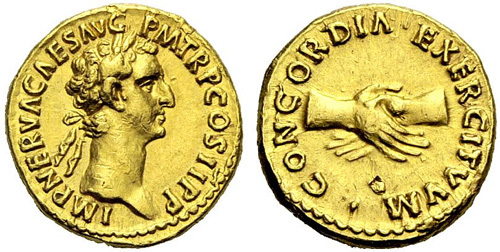 Reverse: LIBERTAS PVBLICA, Libertas standing left holding pileus and sceptre. Obverse: IMP NERVA CAES AVG P M TR P COS III P P, Laureate head right. Obverse: IMP NERVA CAES AVG P M TR POT, Laureate head right. Reverse: COS III PATER PATRIAE, Simpulum, sprinkler, ewer and lituus. 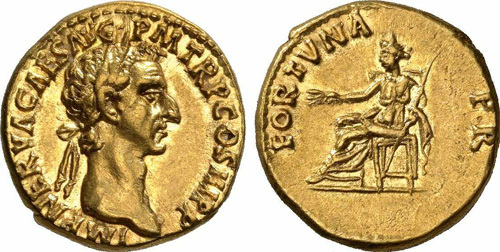 Obverse: IMP NERVA CAES AVG P M TR P II COS III P P, Laureate head right. 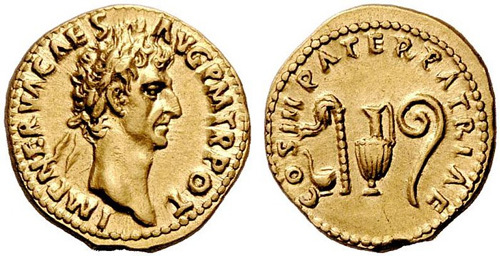 Obverse: IMP NERVA CAES AVG P M TR POT II, Laureate head right. Reverse: COS III PATER PATRIAE, Simpulum, sprinkler, ewer, and lituus.